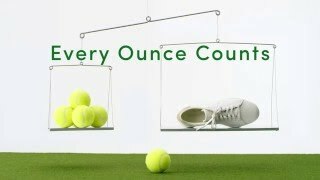 Topping out at just 5.6 ounces, GrandPrø Tennis was born from a simple ethos: everything you need, and nothing you don’t. Smooth leather with suede detail. *Weight based on women’s leather court shoe in size 6 and may vary based on style, materials and size. Don't hesitate one minute... buy these sneakers!!!!! I wore them out of the store. So comfortable and true to size. I have worn them everyday since I bought them...looks great with almost everything you wear. Good looking shoe but it is a half-size too large. I'm a true 5.5. Have fhese in black and white..... so comfortable and stylish.. These shoes are light and very comfortable. I love the color and versatility. Goes with every outfit, and very light and comfortable. I plan to purchase the black pair… Size I purchased was 7 1/2. Light as a feather, perfect for a long trip when you want to pack as light as possible. These are definitely the lightest sneaker I have ever had!! So comfortable!! I bought these shoes before leaving on a trip where I would do a lot of walking. I was nervous going out for a day on vacation where I would be walking close to 10 miles in new shoes, but lo and behold these shoes were amazing! They are so incredibly comfortable! Added bonus is they are super cute too! Can’t say enough good things about these! This is a great sneaker. It looks and feels great! I read the reviews on their retro casual look - and I was a little skeptical. They are so cool looking and so light! I can't wait to wear them. I need the wide - bummed they don't make the woven ones in wide. Great shoe that is very comfortable for walking around and looks great with everything. I have another pair that I have had for over a year and wanted to get the same shoe in another color. very light and so comfortable! match any outfits i love it and i bought the black one too. These shoes are so lightweight, fashionable and comfortable! I can’t wait to wear them on my upcoming trip to Italy! I bought the black ones and LOVE them. I want the white too. I initially bought the 7.5 because people said they run large. Not for me, I returned and got the 8’s. Had so many compliments, even the young gals at work ask where I got them and they keep me styling. So cute! The shoes are super light, chic, comfy. A good buy. Love this white tennis shoe. Comfortable, light weight, fits well and so happy I bought them. Many other brands are chunky and are very heavy, this style and brand is perfect. Favorite pair of shoes EVER! For the record, this is my second pair of the same shoes as I wore them almost every day for a year and decided it was time to replace them. They're lightweight, more dressy than a sneaker, and the perfect shoe to run all around New York City! I've bought 4 additional pairs for gifts for family members. Clearly I'm a fan! I bought the GrandPro for my wife. To quote her, "they are stylish and very comfortable....I wear them every day"! Absolutely my favorite sneakers. Super light, well padded, comfortable. I am on my feet all day teaching when I wear these I don't mind at all. They look great, feel great and I get tons of compliments when I wear them. True to size and fit for me, I will be purchasing other colors. These shoes are light weight and comfortable. I definitely recommend them for the summer. I'm not a sneaker person esp during the summer but became one since I purchased a white pair in July 2016! I had been looking for the most comfortable shoes considering I work a 12hr shift daily. Voila, the answer is the Grandpro tennis sneaker. So lightweight & comfy it didn't hurt my feet at all. I have a bothersome plantar fasciitis on my left foot. I can wear it w/ casual dress, skirt, jeans, etc. I'm purchasing another pair in white & black this time! I'm extremely happy w/ my purchase I decided to just go Cole Haan for my feet! Love love these shoes. They're super comfy and stylish. Smart looking, light and very comfortable. Love them! I haven't had this shoe for long but I can tell it will be a favorite. Some sneakers are so heavy that when I travel I feel like I have to wear them to avoid making my suitcase heavy. These feel like nothing on. I love them! Absolutely LOVE this shoe. It is unbelievably light and comfortable with perfect sneaker style. I can't live without theese. I have the blank & got these whites! Grand pro tennis Sneakers atr great ! Go with everything (I have the white). Very comfortable. I love them! Super light and classy, would look great on any outfit. 4 stars as I have yet to test them out; but Cole Haan does not usually disappoint. Consider a half size down, though. I've always been a 9B, but I read the reviews and decided to get 8.5B. They're a perfect fit. Super recommended. Really lightweight and comfortable shoes! it runs true size and goes well with Jean,shorts or skirt. These shoes are so light. I am planning a fall trip to South Africa and wanted a great travel shoe so I tried these on in the store and loved them. They are versatile enough to wear with a travel skirt or shorts or jeans. Dressed up or down they just work! My husband also purchased the men's version for the same reasons. They are lightweight and stylish. Really wanted to keep them but they are too big for me. I wore these on a two week trip to Europe, without breaking them in (not that you need to break them in), and I didn't get a single blister! We averaged 10+ miles a day, and these shoes were insanely comfortable the entire trip. I just returned from 11 days in Europe and I wore these every single day! I brought several other shoes with me for daytime but never even wore them. I cannot tell you how glad I am that I brought these shoes with me. They were super comfy and look great with jeans, casual dresses, skirts. I have a hard time finding comfortable shoes that fit me, and I was surprised by these, not a single blister or achy foot the entire trip, and we walked ALOT! I wear a true 7 N but usually size down to 6 1/2 in Cole Haan and this was the case here. You gotta try these, you won't be sorry! I'd Walk a Mile for these Shoes! These sneakers are awesome and adorable with any summer outfit, and best of all are SO comfy! They are the whole package! I will be wearing these into the fall for sure! Oh yeah, and I wear an 8 but bought a half size down due to the reviews and glad I did, they do run large. Better grab your pair now before they run out! My favorite any time, any outfit, anywhere sneaker! It's so comfortable. So light. So refreshing. I can dress this up, dress it down, wear it all around the town. But all of my Cole Haan sneakers are my favorite - I may be biased. Go purchase this cute shoe!!! I went into the store to purchase but they didn't have my size in the white. The salesperson said they ran big...and I was a little skeptical. I tried on my true size in a different color and it fit perfectly. Sizing down would have been uncomfortable for me. My friends were able to size down when they purchased. The PERFECT shoe for summer. Easy to dress them up and down. I've worn them from everywhere to Happy Hour, work and a Baby Shower. Comfy, attractive and lightweight! This tennis shoe is light weight and great for travel or running around town.It is so beyond comfortable and really good looking on. It runs a half size large. These are comfortable sneakers. The first day I wore them I walked 1.5.miles in the city and they felt great. All of my shoes or boots I purchase from Cole Haan have always given me comfort from the first wear. This is the ultimate light, comfortable, wear-with-everything shoe. I work in the Cole Haan corporate office, and this has immediately become the favorite shoe in the office. It's great for walking, and super cute with both white jeans and dresses. Light, and sleek style. I have a narrow foot and have room in the width, but with laces it makes it adjustable so I would say true medium width. I wear an 8-81/2 and went with the 8. Still some room at end but not overly big. I tried on in store but since they were sold out in the colour I wanted, I ordered online. . Nice alternative to a true running shoe/ sneaker look that everyone is wearing. Will wear with tshirt dresses and rolled up denim! These are the most amazing tennis sneakers, okay I don't play tennis but so cute with cuffed jeans and a t shirt. They are so lightweight and feel fantastic with no socks. I think these will fly off the shelves so if they have your size and color grab them before they are gone.. I like the look of this sneaker and the fact that it comes in narrow! Simple, clean, good for all occasions. I would LOVE these in all black - option you have has white bottoms, but all black would be really great for work. So cute and comfortable ! A great everyday sneaker! Love this, I already have one and I am replacing them. They look cute and comfortable! Glad to find a narrow classic! Very comfortable - ordering a new pair! 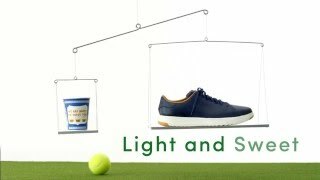 Looking for narrow width tennis shoe; very hard to find. Hope they fit! This shoe is incredibly light, immediately comfortable, and long-wearing. Have professionally cleaned and they will last you years! bought my first pair 2 summers ago and have travelled the world with them. love! your shoes usually fit my feet. I was in the market for a casual all white sneaker that I could wear with anything in the summer. I have these in black velvet and love them! Love these , really comfortable! These sneakers are available in a narrow width (which I need!) and appear to be aesthetically neutral. Looking forward to giving these a try once they arrive. A simple white sneaker in narrow - perfect! I put about 10 miles per day in these shoes while in London and Paris recently. Comfortable while still looking chic. I am buying a second pair while they still have my size. Both this and the Stitchlite Sneaker look comfortable and stylish enough to take on a European trip where there will be both city and country walking. Neutral so as to go with many outfits. i wear a narrow shoe, and i only had one tennis shoe choice...so by default i'll try this one. Very classic white tennis shoes, my second pair!! The sizing is pretty true to size. So many people in my family have this shoe. All of the girls love it! great design.....COLE HAAN JUST CLASSIC. Nice look and very light! Great for travel since they are so lightweight. Love these sneakers, this is my second pair! My second pair! Most comfortable sneaker I ever wore! It is one of the most comfortable sneakers I own! I have them in almost every color. The reviews all focused on how comfortable this sneaker is - and I think they're cute! Are the women's true to size? BEST ANSWER: all of cole haan runs 1/2 size smaller than my usual! I wear a size 10 in any shoe.... and I have many pair of the Zero Grands and they are all true to size. The grandpro is no different for me. No, I find that they run half to a full size big! this question is for cole haan. are these offered in narrow sizes? This style is currently only offered in a medium width. Currently these are not offered in extended widths. 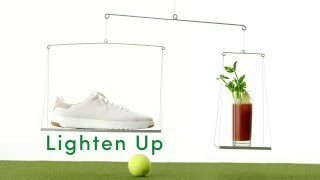 For Cole Haan, is there any plan to come out with this show in a narrow at some time? Can I spray these shoes with waterproof spray? How do you clean them? BEST ANSWER: I have the men's version and yes I used a waterproof spray made by ugg and they kept their color and texture. They actually shed dirt pretty well after being treated and did fine in wet conditions. We do not recommend waterproofing spray for these leather sneakers. Regular leather care and avoidance of moisture are the best ways to keep these shoes looking their best. Is there a slightly higher heel or are they totally flat? BEST ANSWER: They are flat but there is a slight lift in the heal of the insole so it does not feel flat when you where them. They are extremely comfortable. BEST ANSWER: This sporty style was originally made in AA widths but in limited quantities which are now sold out and will not be replenished. To find similar styles in AA width, you can use the filter drop-down tabs on the side of the shoe page to shop by size, width, color and more. I usually wear size us 6 (narrow feet), sport shoes adidas wear size 6.5, should I buy 5.5 or 6 or 6.5? BEST ANSWER: The shoe size related to the length toe to heel. The best way to determine your shoe correct size is to visit a shoe store or shoe department and have your foot measured on a Brannock device. Once you know your correct size, check the Customer Reviews tab on the product page - there can be lots of good fit information there. BEST ANSWER: It has average arch support - the insole is flat. BEST ANSWER: Of course, you have to be a bit careful when wearing white shoes, but for the most part, wiping with a damp cloth and mild detergent, and perhaps a little dab of athletic shoe cleaner now and then should keep them looking sharp! I usually wear an 8n in Cole Haan shoes. I am a true narrow. What size do you suggest I buy, or should I pass? BEST ANSWER: Hi, I am usually a size 7 in Cole Haan.... but I needed to go down a half size (6.5) and after a few wears, it fits perfectly! Get them! I often have to buy wide shoes. The medium Grand Pro is just barely wide enough for me, so they run wider than most shoes I think. You should buy the 8n as these sneakers fit like any other cole haan shoes, especially if you wear them without socks. I thought these were so on trend and cute! They weren't narrow enough for my narrow feet, though and they went back. I'm a size 8 and narrow as well and the 8 fits great! Highly recommend purchasing! super comfy and light!! I would purchase size 7.5; I always wear a size 9 in CH shoes and I went down a half size to the 8.5. BEST ANSWER: They are sturdy, very comfortable and do take a little time to break in. Perhaps a little stretching, but just to fit. If you need them to stretch more, say in width, I would suggest wearing them with heavy socks for a bit. They’re genuine leather so they do stretch and mould to your feet with wear. However, I wouldn’t count on them to stretch half+ size up. Not really but they are super light & I love them! This is my second pair and I have not found them to stretch. Just love them! are these shoes flexible? why do i get the impression that the so called leather part feels like a carton and that if i walk it would rip? BEST ANSWER: These shoes are totally flexible!! The leather is AMAZING! I LOVE these shoes! Getting ready to order a second pair because I wear them all the time. Can also use a magic eraser to keep clean!!! These shoes are super comfortable & flexible! I've had mine for almost two months and they are holding up quite well. They are very flexible and lightweight. they are great for walking or being on your feet all day...and stylish..! These shoes are super flexible and light. I wear them often and they are in excellent condition. Not at all! Super comfy. I love these shoes. Can I run in them? BEST ANSWER: No, I tried to do a Zumba class in them and your feet get sweaty because they're leather. Great for walking/ running to catch the subway, but not an athletic shoe. It's more of a fashion walking shoe, I won't recommend to go and exercise with it. Yes, in an emergency. Recommended: Get a good running shoes. I wouldn't run in them, but you could walk all day! How do you keep them clean I have the off-white color? BEST ANSWER: We like Maryellen's idea - keep one for "best"! White footwear always requires a little extra care. Wipe regularly with a damp, soft cloth after wearing. It's a good idea to apply spray suede protector to any suede areas to provide a light layer of protection from soil. You can use any good white leather sport-shoe cleaner on the leather uppers - according to manufacturer's directions. For the soles, we recommend using our Grand Sole Cleaner which is specifically designed to clean the soles and edges of rubberized footwear. I bought two pair—one to wear all the time and one to wear when I wanted them to look fresh. You can wipe gently with a damp cloth and there are special cleaners on the market for white soles, though I’ve never used them. I just bought this pair of shoes and they feel stiff and uncomfortable, contrary to most of the reviews. Do they have a break in time or should i just return them? BEST ANSWER: Customer Reviews are usually pretty true to form. If you are unhappy with the shoe, return it to the place of purchase. I have a pair in pink and they are some kind of suede. How do I clean them? BEST ANSWER: I bought the off white, pre-treated with a spray. No stains so far! BEST ANSWER: The insole is not removable. Is it easy to clean and to maintain? Also is the leather stitched on the sole? BEST ANSWER: Very easy to clean (especially with a Mr Clean magic eraser!